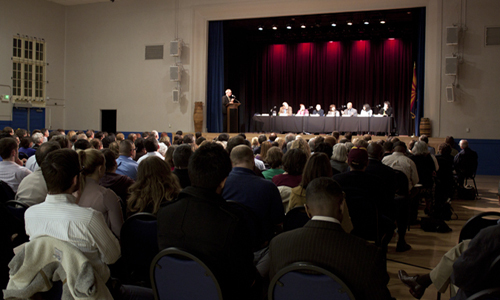 Phoenix Mayoral Candidate Forum – A debate-style forum at the Lexington Hotel on June 9, 2011 featuring five of the mayoral candidates for the City of Phoenix. Candidates Wes Gullett, Claude Mattox, Peggy Neely, Greg Stanton, and Jennifer Wright participated; Arizona Republic reporter Richard Ruelas moderated. Watch the videos here. State of Sustainability Forum – Downtown Voices Coalition hosted a State of Sustainability Forum at the George Washington Carver Museum and Cultural Center on January 17, 2012 to discuss the most pressing of sustainability issues in metro Phoenix. Moderated by Charles Redman, founding director of ASU’s School of Sustainability, the forum featured a panel of six local experts and Andrew Ross, author of the book “Bird on Fire: Lessons from the World’s Least Sustainable City.” Watch the video here.